GIN-SSOGIE has been taking part in the development and organisation of the meeting for close to a year now with several other faith-based and/or LGBTIQ organisations including the International Fellowship of Reconciliation (IFOR), Muslims for Progressive Values (MPV), Soulforce, Outright International, Political Research Associates and ILGA. Please find the link to an article written by project-leader, Patricia Ackerman, from IFOR. LGBTIQ people continue to be under siege by religious homophobia and persecution masquerading as free speech at the United Nations. 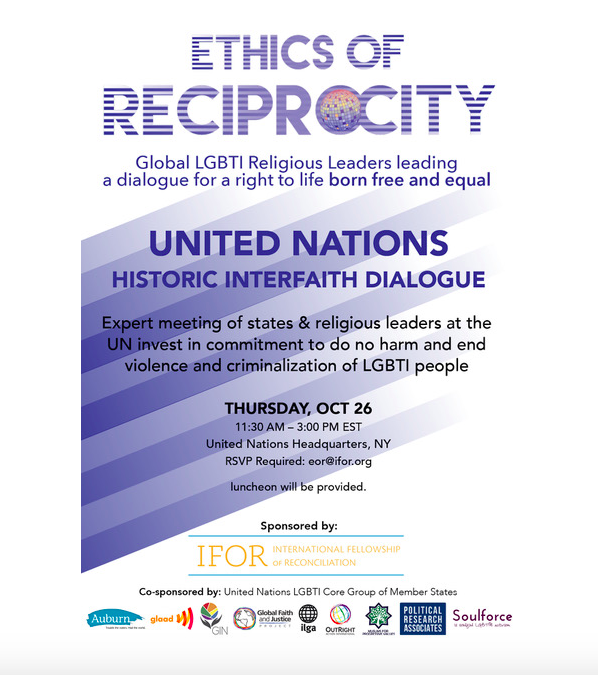 And therefore Global LGBTI religious leaders will be engaging conservative religious actors and Member States at the United Nations Headquarters, on Thursday 26th October (from 11.30AM until 3PM EST) in an effort to work towards ending violence and discrimination against LGBTIQ people. We invite your support and would appreciate greatly your presence. You may still attend, by RSVPing to eor@ifor.org until October 24th. Luncheon will be provided.